Louisville, KY (April 16, 2013) – The latest Marketbasket Survey, conducted by the Kentucky Farm Bureau Federation in March 2013, indicates that average retail food prices in supermarkets across the state increased slightly during the first quarter of the year. According to the survey, the total cost of 40 basic grocery items was $116.27. This total reflects an increase of $0.74, or 0.6 percent, from the same list of items reported in the previous quarter. Kentucky’s most recent retail food price results reflected small increases overall, yet fared slightly better than the American Farm Bureau Federation’s national Marketbasket Survey (which monitors the average price of 16 basic grocery items from states across the country). Its most recent average price total increased by approximately 2.0 percent. On an even larger scale, the U.S. Department of Labor’s Bureau of Labor Statistics’ Consumer Price Index data that was released today (reflecting figures through March 2013), revealed that overall national food-at-home prices decreased by 0.1 percent in the last reported month. However, looking at food prices over a longer timeframe, Kentucky retail food prices as recorded by the Marketbasket Survey are actually beating the national trend. According to the Consumer Price Index, the national average price for food at home has grown by a total of 1.0 percent over the past 12 months. 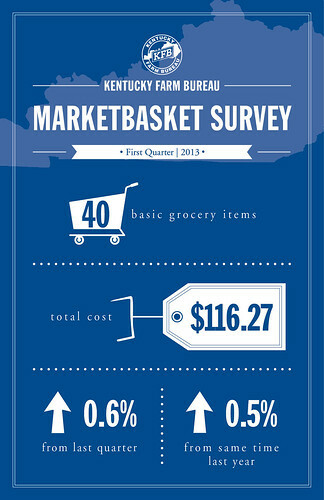 Today’s Marketbasket Survey total reflects a just 0.5 percent increase over the average price total in the first quarter of 2012. Of the six food groups recorded in Kentucky Farm Bureau’s most recent survey – beef, dairy, fruits and vegetables, grain, pork, and poultry – the dairy category showed the greatest total increase with an overall average price jump of 8.0 percent ($1.78). The beef category made the largest (and only) average decrease in price at 6.4 percent ($2.12). Half-gallon vanilla ice cream had the greatest single-item increase with an average price jump of $0.89, while the highest single-item decrease was T-bone steak, falling an average of $0.99 per pound. Overall, 21 of the 40 items in this survey experienced increases in average price, 17 decreased and two items (Idaho potatoes and bell peppers) were unchanged. Looking ahead, the USDA Economic Research Service reports that despite last summer’s severe drought in the Midwest, overall retail food prices remained flat across the country. The drought did affect the price of corn, soybeans and other field crops, though, and is ultimately expected to drive up retail food prices in 2013. Consumers should be aware that higher field crop prices will not only impact grain-based products, but will also raise retail costs for beef, pork, poultry and dairy products as higher feed costs negatively impact meat product prices. “Overall, food prices have remained remarkably stable over the past two or three quarters, particularly given the run-up in energy prices over this most recent quarter,” said John Anderson, American Farm Bureau Federation’s deputy chief economist. The remainder of 2013 may prove contrary to that trend. “Looking ahead, we expect food prices to rise by 3 to 4 percent, which is slightly higher than the average rate of inflation over the past 10 years,” added Anderson. Even when grocery prices seem to fluctuate from quarter to quarter, Americans continue to enjoy some of the lowest food prices in the world. Shoppers in the U.S. spend only about 10 percent of their disposable income on food each year. Those costs remain far lower than any other country in the world thanks to many of the agricultural efficiencies utilized in America. Today the average U.S. farmer produces enough food and fiber to provide for about 154 people – a dramatic jump from an average of 19 people per farmer back in 1940. Yet while more food is now being produced on less land, the farmer’s share of the retail food dollar in America is down. According to the U.S. Department of Agriculture’s new Food Dollar Series, a farmer earns less than 16 cents per dollar spent on food, down significantly from the 31 cents earned in 1980. Kentucky Farm Bureau Federation has conducted its regional Marketbasket Survey over the past four decades as a tool to reflect local retail food pricing trends and their relationship to what farmers receive for their raw commodities. Cities reporting on the Kentucky Farm Bureau Marketbasket Survey for the first quarter of 2013 include: Alexandria, Augusta, Bardstown, Brandenburg, Brownsville, Cold Springs, Eddyville, Elkton, Flatwoods, Flemingsburg, Gamaliel, Glasgow, Grayson, Harrodsburg, Hartford, Hillview, Hopkinsville, Irvine, Lawrenceburg, Louisville, Madisonville, Mayfield, Munfordville, Nancy, Owensboro, Owingsville, Powderly, Richmond, Russellville, Scottsville, Shelbyville, Tollesboro and Walton.